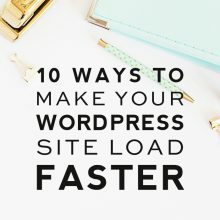 Whether you are new to WordPress or a seasoned veteran, you may be looking for the best way to organize your blog. 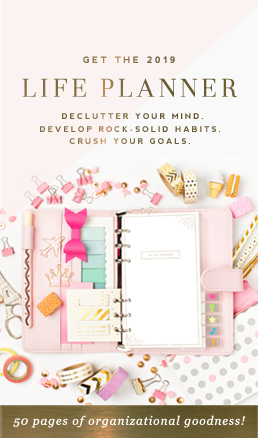 We are all looking for ways to be a little more organized, right? 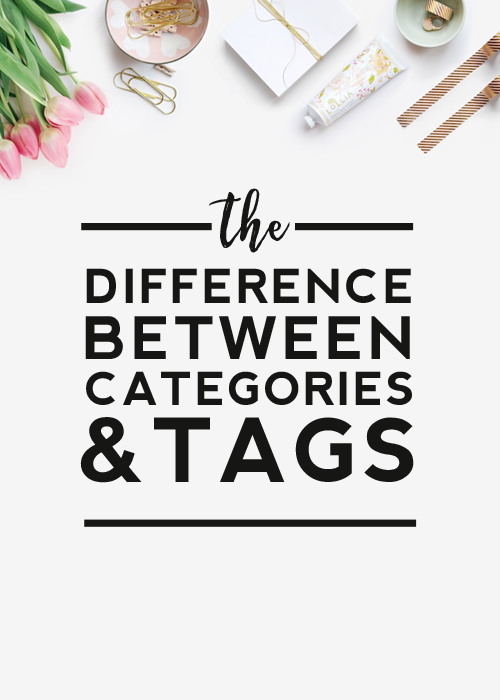 Today, I’m going to explain the difference between categories and tags in WordPress, the two main ways of adding structure to your blog so readers will be able to easily find specific content. 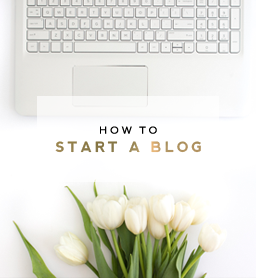 Think of categories like the Table of Contents or chapters of your blog. They are the broad topics you want to write about. Generally speaking, if you are going to write about a topic more than once on your blog, you should probably group them with a category. For example, if you are a food blogger, you may have categories like appetizers, main dishes, desserts, etc. Likewise, if you are a fashion blogger, category examples may be wardrobe, accessories, hair, make-up, etc. 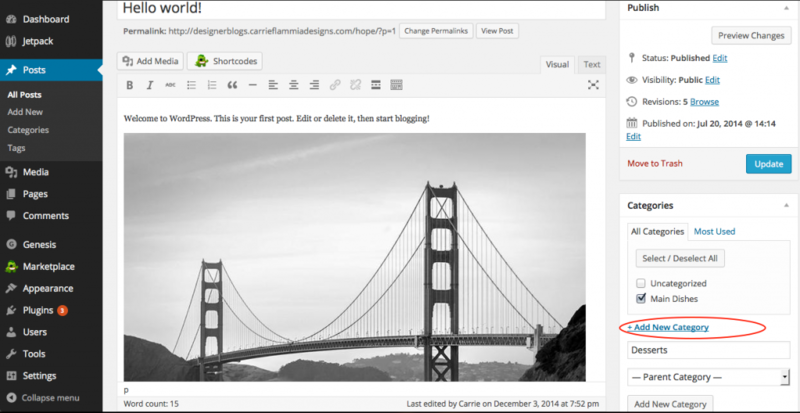 WordPress also allows sub-categories to further organize posts, but these aren’t obligatory. 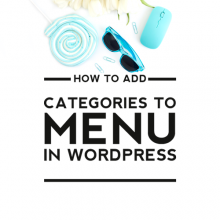 There are two ways to add categories to your WordPress blog. Enter the Category Name and Slug into the form. A slug is how the category will appear in the web url and should always be lowercase and contain only hyphens to separate words. If the new category is a sub-category, you can choose the parent from the Parent drop down menu. It’s always a good idea to create the parents (or main categories) first and then the sub-categories so the parents will show in the drop down and sub-categories can be properly placed in their hierarchy. Push the blue “Add New Category” button at the bottom of the form and you will see your new category appear in the list to the right. If you created the categories via the Dashboard, you will see a list of your categories to the right of your post editor. You can simply check the box beside the desired category to categorize a post. Once you click the “Publish” button (or update if it’s a post in progress), the category will be added to that post. If you wish to add a new category in the post editor, you can do so. Under the category list, click the “Add a New Category” link. Underneath the link, you can now enter the name of the category and select the parent category if the category has one. Again, once you click “Publish” or “Update”, the new category will be added to the list in the sidebar. Categories are often useful as links in your navigation bar as well. Since categories are your main topics of your blog, you may want to make it really easy for readers to access that information. You can find out how to add categories to your navigation bar HERE . While categories are broad, tags are very specific. If categories serve as the Table of Contents, tags are like the index or keywords of your site. In the food blogger example above, you may decide to create a tag for specific meat types – chicken, beef, pork, etc. If someone Googled “chicken main dishes” and navigated to your blog, having the category of main dish and a tag of chicken may bring the reader to several of your recipes. You can see how both categories and tags work together to create a nice organized structure. 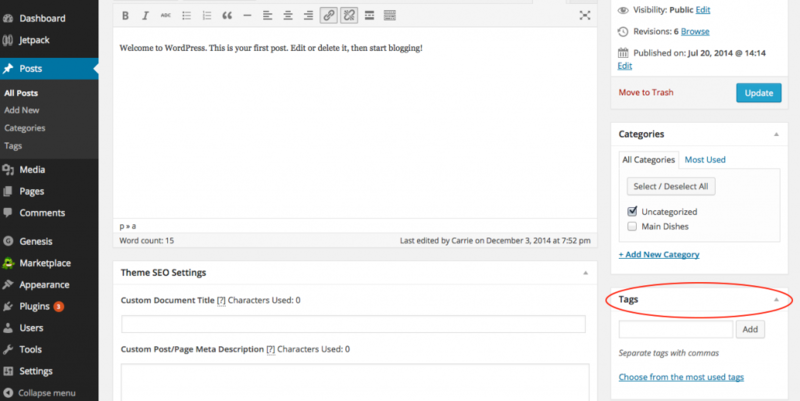 Like categories, there are two ways to add tags to your WordPress blog and the process is very similar. Fill in the Tag Name and Slug and then click the blue “Add New Tag” button at the bottom. The tag will show in the list to the right. Fill in the Tag name and click the “Add” button. If you’d like to tag a post with an existing tag, you can see a list to choose from by clicking the “Choose from the most used tags” link. This is a very good question. 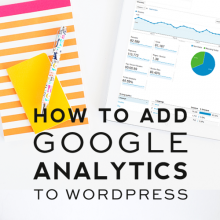 At first thought, you may think that lots of categories and tags would be useful to readers because they could navigate to a specific post in many different ways. This isn’t always true. Over categorizing and tagging may lead to confusion and a lack of a clean organizational structure. Most SEO (Search Engine Optimization) masterminds – the people who study the way people search for content on the web and reach specific sites – recommend that bloggers categorize their posts with two or less categories and only tag the post with the most useful tags. If you can’t think of a tag, chances are, you might not need one! Linking content to other content in your blog is a good idea and may lead readers to get interested in several topics, increasing their chances of remaining on your blog and/or returning in the future. For example, I could be reading about a make-up technique in a fashion blog when I see “check out other make-up tips and tricks here.” The make-up link would take me to the page of all the posts under the make-up category. Continuing in the post, I may read “see my favorite lipsticks” which could link me to a tag page of all the posts about lipsticks. See how that works? Not only do categories and tags serve as an organizational tool, but they also give you the opportunity to group posts and link to more content on your blog. I hope this gives you all a better understanding of the difference between WordPress categories and tags. Now go forth and organize!